From a distance we see Glendalough monastery’s round tower, a 30 m slender tower that has stood firmly in the ground here since the 8th century. 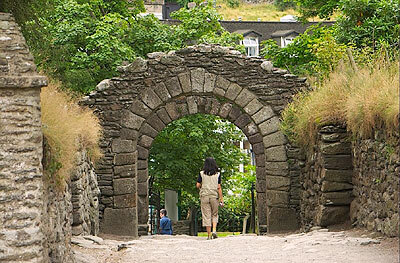 Glendalough is famous for its monastic settlement and what remains here is a fine example of early Medieval Ireland. This historical medieval village is located in the Wicklow Mountains National Park in the east of Ireland, some 80 km south of Dublin. Glendalough monastery preserves the memories of St Kevin, a man who rejected a life of privilege, choosing instead to live as a hermit at Glendalough. St Kevin was born in 498 and was a descendant of the royal House of Leinster. The lack of concrete information about St Kevin has resulted in many tales being told of him, including one that said that he lived to 120. 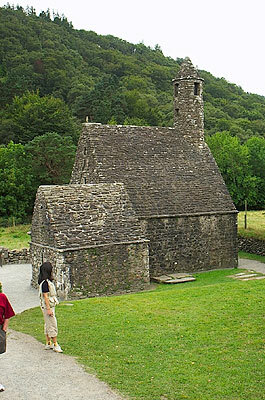 Glendalough monastery was set up as a learning centre, devoted to the care of the sick. It was a popular place of pilgrimage, especially on St Kevin’s feast day on June 3. Considering that the buildings were built during medieval times, they have stood the test of time very well. Tower – The style of tower here is believed to be rare outside of Ireland. Apart from serving as a belfry, it was also the treasury and watchtower. It’s entrance is 4m above ground level and only accessible by ladder, making it a safe place from invaders. Seeing this serene and secluded place today, you wouldn’t imagine that Glendalough was once raided by Vikings, Normans and the English. Main Entrance – The entrance to the monastery complex is a double-arched stone gateway and one of the most important monuments. St Kevin’s Cross – This Cross, with Celtic decorations, stand in the surrounding cemetery which is still used by villagers. St Kevin’s Church – This private chapel is sometimes called St Kevin’s Kitchen because of its chimney-like tower. The Visitor Centre has an interesting exhibition and an audio-visual show on Glendalough’s medieval history and discoveries. See photos ofGlendalough and St Kevin’s Monastery at the Travel Signposts. From Dublin, St Kevin’s Bus Service (www.glendaloughbus.com) runs daily services to Glendalough via Bray.